YAhoo.... this year I got free Durian to makan loh.... but still have to wait for few more months lagi lah. TOday is the PH so balik kampong and also spot check see got Durian or not! mmm not bad this year the quantity minimum look like pun got over hundred biji durian there lah. Hopefully the weather is good no big rain big wind and kacau them and also the monkey and squirrel didn't come and curi makan too. By looking the white durian size maybe by the end of August or beginning of September they masak can eat liao. Thai Durian still have to wait a bit longer like November baru can eat lah! Durian Kuning.... mmmm don't think this year can eat lah!! Anyone of you still remember the last 2 years the durian tree one of the branch putus because of the durian too much and too heavy (Watch Here) hopefully this year not repeat again! 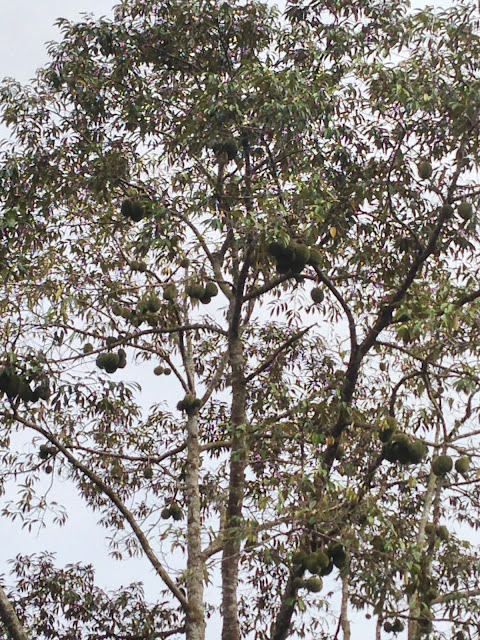 I wonder how was the Durian tree at the Ripas highway there oh.... Got durian sudah kah? I'm waiting for you all Baby!!! Do You Want To Fly With One Extra Free Ticket??? Minions Break Record Again Today. New Focus 1.6 Is Here! I Didn't Know It Run Already!! They Want To Say Thank You To You Bro!! !